The first "Out of Space" concert in the Temperance Beer Co. parking lot. This was the first concert of the summer series. When SPACE first opened in Evanston in 2008, they had little more than a card table for a bar, Kristen Mitchell said. Ten years later, SPACE is organizing a summer concert series to celebrate a decade of live music. 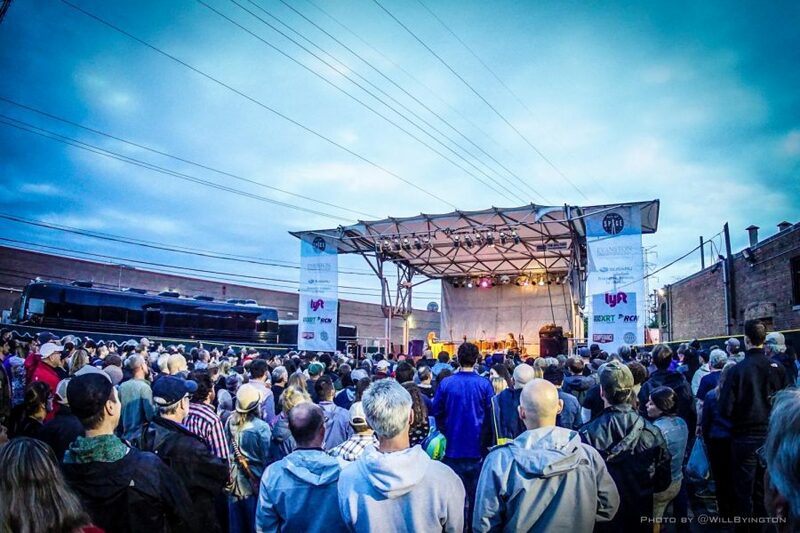 Mitchell, manager of music operations and creative services at SPACE, said the “Out of Space” concert series will take place across four weekends and three locations in Evanston this summer. The first show will take place at 6 p.m. Thursday evening at Temperance Beer Co., and will feature folk duo Shovels & Rope with singer Becca Mancari opening. Mitchell said she and the rest of the SPACE team have worked to ensure that “Out of Space” will bring a “fun outdoor summer vibe” to the city of Evanston. The planning process, which started in late 2017, involved not only finding venues and artists, but also making sure that the ambiance feels right, she said. Two more shows will follow at Temperance Beer Co. Friday and Saturday, then “Out of Space” will return to Temperance July 19-21, Mitchell said. She said the concert series also includes a “girl power weekend” at the Canal Shores Golf Course July 27-28, featuring Chicago native and blues singer Mavis Staples and folk duo Indigo Girls. “Out of Space” will culminate in a “Big Evanston Block Party” August 25-26, which will take place in front of SPACE on Dempster Street and Chicago Avenue, Mitchell said. Ben Geerts, taproom manager at Temperance Beer Co., said the outdoor space at Temperance can accommodate up to 1,200 people. He said the taproom will be open for the concerts and there will be beer trucks outside as well. Other attractions include food trucks and outdoor games, he said. Sam Nelson-Mann is the co-founder of Three Legged Tacos, one of several food trucks that will be at the Temperance Beer Co. lot this weekend. He said as someone who has been involved in the Evanston community over the years, he is excited to see a “high profile” music festival in Evanston. After spending months organizing the concert series, Mitchell said she is looking forward to sharing a beer with her co-workers and seeing their hard work come to fruition.